RIT is celebrating its sixth annual TAG Day today, Feb. 13. RIT community members are encouraged to celebrate by thanking donors with messages on social media using #RITTAGDAY. For the past six years, RIT has celebrated TAG Day to show appreciation for those who have given back to the university. Whether they give their time, skills or monetary support, each gift helps RIT continue to thrive. In addition to hanging tags in different areas of the university that have been impacted by donor support, The Fund for RIT is hosting a TAG Day Fair from 11 a.m. to 2 p.m. today, Feb. 13, at the Fireside Lounge in the Student Alumni Union. At the fair, there will be games, educational information about philanthropy, T-shirt giveaways for the first 150 students to post on social media with #RITTAGDay, and other fun activities. There will also be information on graduation cords for senior donors, and a representative from Student Government will be on hand to talk about the group’s efforts to raise funds for the Representative Student Organizations Endowed Leadership Award Fund. 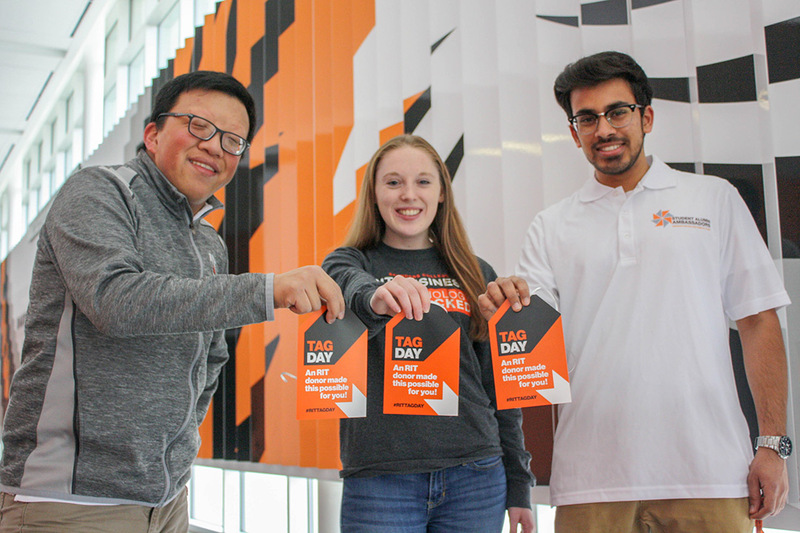 “TAG Day is an opportunity for the campus community to show its appreciation to RIT’s nearly 13,000 donors and let them know that their gifts are important in continuing to maintain and grow the great RIT experience we have here,” said Marisa Psalia, executive director of the Fund for RIT. Gifts given to the university support Transforming RIT: The Campaign for Greatness and provide funding for clubs, sport teams and scholarships, as well as colleges, laboratory technology and so much more. Omkar Borse, a senior mechanical engineering major, is a student donor, member of RIT’s Student Ambassadors and a telefund caller who understands the effect donor support has on his experience at RIT. Collectively, more than 1,500 student, faculty and staff donors have committed over $400,000 in this fiscal year. Their participation also sends a powerful message about the importance of giving and encourages other members of the RIT community to join them in making an annual gift to the university.